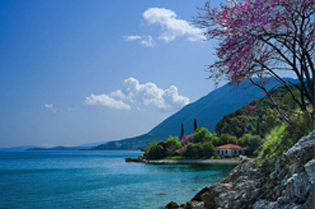 Lefkas, or Lefkada, as the Greeks say, is a remarkably green island in the Ionian sea on the west coast of Greece. Unlike many other island’s with an agreeable Mediterranean climate, Lefkas is not spoilt by mass tourism but remains a calm and authentic place. 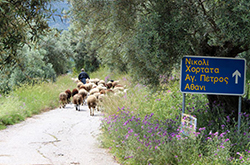 Lefkas is fertile and rich in hills and mountains that are covered with dense and verdant vegetation. The two highest peaks rise over 1000 metres. The popularity of Lefkas is due to its gorgeous landscape white pebble & shingle beaches that are seemingly endless, paradise-like turquoise waters and majestic vertical rocky cliffs. It is the fourth largest island of the Ionian Islands, after Zakynthos, Kefalonia and Corfu. 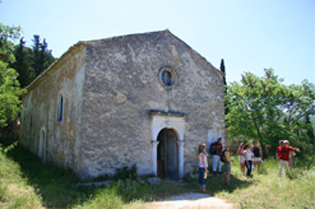 Lefkas is rich in history and culture, starting from ancient times. It is believed that Lefkas was the island that Homer called Ithaca and on which he located the palace of Odysseus in his Odyssey. The landscape on the eastern coast of the island is covered in lush virgin woodland of fragrant firs and pine trees. Smaller islands are visible just offshore. On the other side, the west coast hides a more rugged terrain; the picturesque villages perched on the hillsides enjoy views of some of the most breathtaking award-winning beaches below, many of which are almost deserted even in the height of summer. The name Lefkas comes from the Greek word for white, referring to the white cliffs at the southernmost tip of the island. According to ancient mythology, it was here where Sappho jumped into the sea after her love was unrequited. Our base in Vassiliki Bay is a gorgeous sight, framed by mountains and backed by a verdant valley with abundant olive and orange groves. There are spectacular views of the sapphire sea and the nearby islands of Cephalonia and Ithaca. Early morning, the waters are serene and quiet, ideal for trying your hand at kayaking or paddle-boarding. In the afternoon, the bay comes alive with the multi-coloured sails of boats and windsurfers – a great time to enjoy your sailing taster to the max! 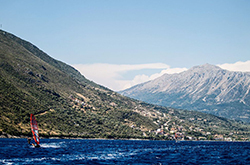 You’ll discover much of the area’s natural beauty if you join in our walks or cycle rides in and around Vassiliki. But if you want a truly unique experience, join in our sea safari that includes numerous stops at secluded beaches for sun-bathing, snorkeling, and swimming – and, if you’re lucky, you’ll catch sight of dolphins and flying fish along the way! Our beachfront accommodations are located just yards from the sea’s edge, in two charming family-run hotels as well as a selection of apartments and studios all set in landscaped gardens. Our simply-styled and comfortable air-conditioned rooms are all en suite, with balcony or terrace offering magnificent views of sea, countryside, or mountains. You’ll find that our beach and pool bar restaurants provide the ideal relaxing atmosphere and offer a range of appetising, homemade fare – everything from breakfast to an early evening meal. 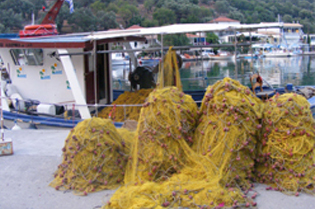 Nevertheless, we encourage all of our visitors to enjoy the Greek flavours and variety of the local tavernas, bars, and cafes in the Vassiliki harbour. For that reason, we don’t price our holidays to include any meals. You’re welcome to stay on site for breakfast, lunch, or dinner, or take a short walk to the village to treat your palate to local cuisine. Our staff will happily recommend their favourite haunts – and there are many! If you'd like a precise quotation for your holiday, with actual dates and availability, then click on the button below and we'll get back to you shortly. Stay up to date... with the latest offers, updates, news and more!